So we decided to go about it the hard way and our very own THOW is well on the way to being the home of our dreams. 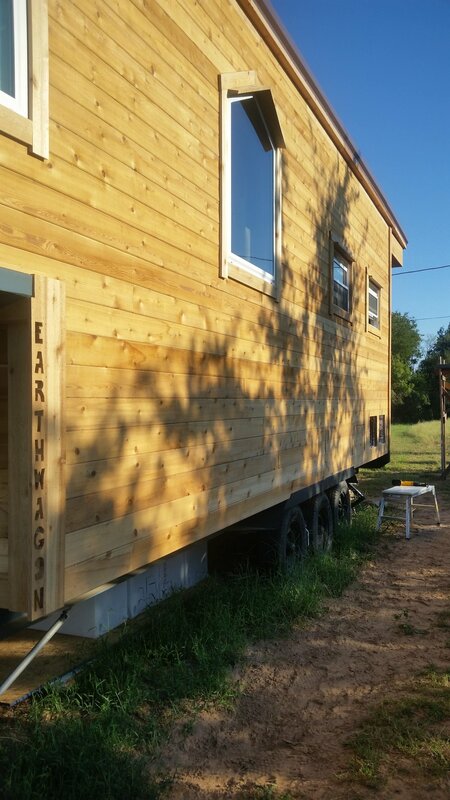 Follow the transformation, as we turn a heavy-haul farm trailer into the Earthwagon! The original trailer deck was removed and the dovetail in the rear was flattened and extended to provide counterbalance for the structure to be built on top of the goose neck platform. Several sub-floor compartments were added for the water, electrical and other system components. The most obvious consideration for tiny living is where to keep stuff and things. For our personal items, the bedroom was fitted with access compartments situated around where the mattress will be. Then there are four outside access compartments for water, batteries, firewood and a cat litter box. After much deliberation on door and window placement, roof pitch and other framing details, the project finally begins to resemble a house. The roof is extended off the back of the wagon to provide extra length to accommodate more solar panels and to give us a little shade as a patio cover. A lot of windows will let in plenty of light and give our tiny space an open feel, but they also allow more thermal conductivity than do the insulated walls. The added layer of foam with a radiant barrier under the siding will help keep our indoor temperature just right. As our final barrier to the outside world, we chose cedar tongue and groove siding for it's longevity and slightly better insulating quality. With a storm door over the front door and drip edges built into the window trim, our investment will be well protected. We used a clear weather sealant to lock out the moisture and it really brought out the character of the wood. The outside compartments hardware are gate hinges and spin clasp latches painted to match the storm door on the other side.